Last year we recorded some incredible tracks with British rap and experimental artist Little Simz, for her forthcoming album. Listen to us here, on the first single ‘Offence’, taken from the album. 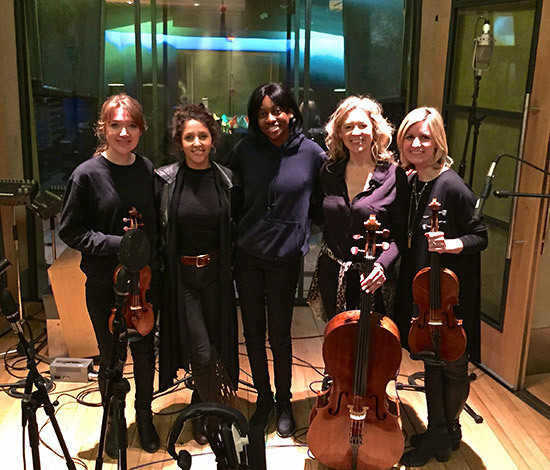 Strings Arranged by Rosie Danvers, Performed by Wired Strings, Produced by INFLO and Recorded at Metropolis Studios, London, 2018. Pitchfork: From its opening moments, “Offence” lurches forward with aggressive momentum: a drum break punches through the whole track, bound so tight it sounds like it’s shaking with adrenaline. The bassline is chunky and anxious and other production elements—a flutter of creaking flutes, a frantic swarm of strings—flare up like the chatter of an uneasy cityscape. The boom and snarl of Little Simz’s voice make it obvious she’s at the top of the food chain, and so she prowls around, the beat thumping her chest. She raps with a remarkable directness: “You do not scare me, no you are not a threat,” she explodes. It sounds like a battle cry, almost giddy with strength. As a return single, “Offence” is a roaring statement of intent, and Little Simz sounds bigger and stronger than ever on it.